We recently reported on the new independent film Dr. Mabuse, which features Dark Shadows stars Jerry Lacy (Reverend Trask), Lara Parker (Angelique) and Kathryn Leigh Scott (Maggie Evans). The first cast image from the production is now online and can be seen above. 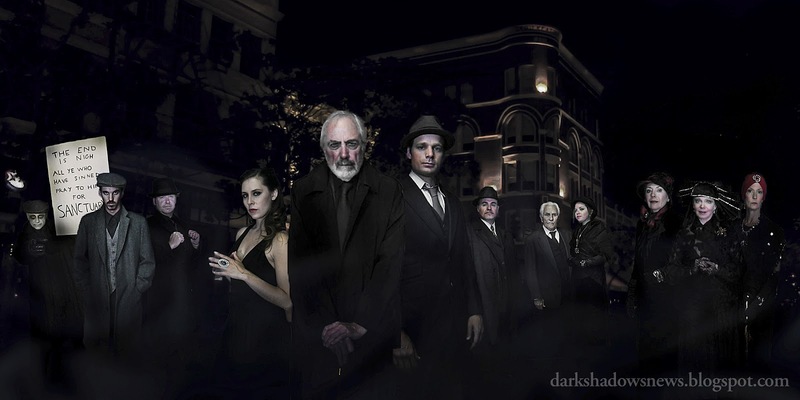 Pictured are (L to R): John C Smith as the Apocalypse Man, Derek Mobraaten as Tom Smith, Julian Grant as Edward Hull, Bahia Garrigan as Christina Novello, Jerry Lacy as Dr. Mabuse, Nathan Wilson as Inspector Carl Lohemann, David Graham as City General Oscar Lang, Linden Chiles as Inspector Norbert Von Wenk, Vivian Brasch as Lady Levana, Kathryn Leigh Scott as Madame Von Harbau, Lara Parker as Madame Carrozza and Annie Waterman as Madame Hecate. Click on the image for a larger view. The first teaser trailer for the film can be viewed in the window below. Dr. Mabuse is due for release in 2013 and more information can be found on the production's official website. To view our gallery of behind the scenes stills, click here. Steep in Mystery and chilly creepiness!! Awesome trailer look forward to "Doctor Mabuse" release 2013..'great Cast and the poster looks amazing. Isn't Chris Pennock in this story, as well?